Companies like Fender, Gibson or PRS tend to offer few body stylings, but more color palettes or electronic setups. The cool thing is that even though two models may look the exact same, chances are they have a completely different sound. While many factors come into play that affect the sound of the guitar, perhaps the biggest factor lies at the beginning of the electrical signal path… The pickups! Even more interesting is that the majority of pickups work using the same phenomenon… Electromagnetism! 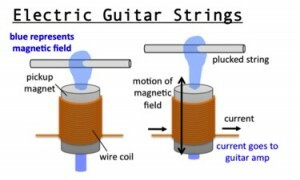 A pickup is essentially a magnet wrapped in a copper wire, which creates a magnetic field around itself. When a metal string vibrates within this field, it creates a disturbance which in turn creates electrical energy in the coils. This energy flows through your cable to your amp, where it is converted back into an acoustic sound by the speaker. When looking for a guitar or different sounding pickup to compliment your playing style, it’s good to have an idea what ballpark you might be in. Without further adieu, here’s a few things to look out for during your search! 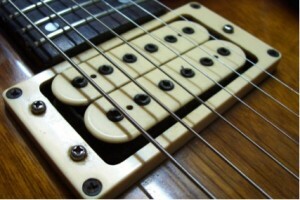 There are two main materials that a pickup’s core can be made of: ceramic and alnico. 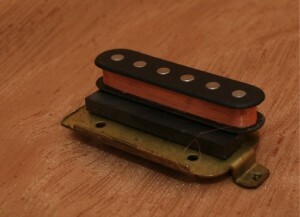 Ceramic pickups tend to give a harsher, brighter tone, while alnico are usually more warm and smooth. That said, alnico pickups can be broken down even further into types II, III and V. Alnico III is the weakest of the three, followed by II, and then V being the strongest. 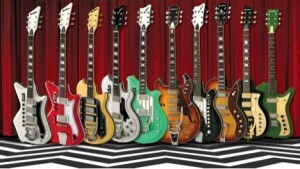 What’s the best way to find the right pickup for your playing? As I’ve said in other articles, experiment! The two main types of pickup coils are single coil, and double coil (otherwise known as a humbucker). The single coil pickup was the original design, featuring one magnet with one coiled wire wrapped around it. The design worked, but it allowed for exterior frequencies to be picked up and amplified other than the guitar. The humbucker was invented to cancel out these noises, by adding a second magnet with its polarities facing opposite the other magnet. This creates an out of phase effect, and drastically lowers the amount of noise that can get through. 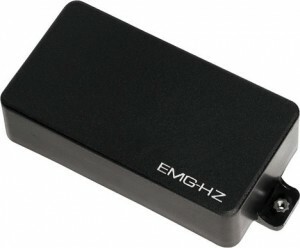 What it also does is increase output, and has an overall warmer, bassier tone than the single coil. When you strum an acoustic guitar close to the bridge, it sounds a lot more thin and trebly than when you play over the sound hole. Electric guitars work the same way: a pickup placed close to the bridge will amplify those thinner tones. To compensate, pickup manufacturers tend to wind their bridge pickups “hotter” than their neck pickups. This adds warmth and output, so unless you want an extremely loud neck pickup and extremely quiet / shrill bridge pickup, try not to mix them up! Pickup height is important too. Ideally you’ll have the pickups set in a way that there isn’t much of an audible volume difference when switching from pickup to pickup. 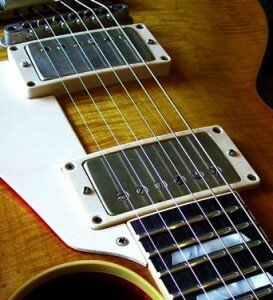 Often you will notice the bridge pickup will have to be slightly higher than the neck to achieve this. 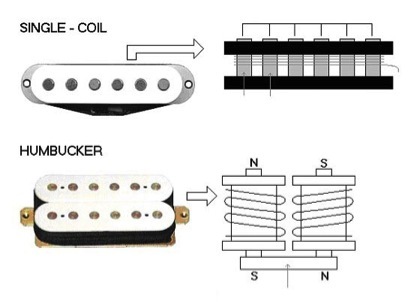 Again, experiment and test different heights of your pickups to see how it affects your tone! Passive pickups function in the way I’ve described thus far. Active pickups have one major difference: a preamp powered by a 9V battery. Why? They have a lesser number of coils in the pickup, which requires the extra power boost. The lesser coils make for smaller susceptibility to feedback, but a much smaller dynamic range than that of the passive pickup. Many hard rock and metal musicians have gone the way of the active pickup, as they rarely need to have an output any less than “extreme”. At the end of the day, you shouldn’t buy a guitar or replacement pickup because (insert name of famous guitar player) uses it! You don’t know what other equipment said player is using, the way their album was mixed, or how their sound technician works. The bottom line is: you are not (insert name of famous guitar player)! They already did their “tone quest” and found what works for them. So, try as many pickup combinations as you can. Try playing the guitar at various volumes, not always on ten! See how different pickups change your tone or even your mood while playing. You may even discover that the way a different pickup sounds will make you play differently and try new things, which is definitely a good thing!